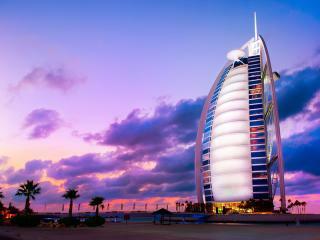 Considered an attraction in itself, the Burj Al Arab is one of Dubai’s most luxurious hotels. Situated in a sail-shaped building that rises 321m into the sky, the hotel is an icon in the Dubai skyline. Offering a luxurious range of accommodation overlooking the Dubai coastline from floor-to-ceiling windows, the hotel is also home to an outstanding range of onsite facilities including a full service spa and a great range of dining options. The hotel also enjoys access to its own private beach and is just a short walk across the island bridge to the Wild Wadi Waterpark. Located on 2km of private beach, Jumeirah Al Qasr - Madinat Jumeirah offers luxury accommodation close to the Mall of the Emirates. Surrounded by lush landscaped gardens and canal-style waterways, the resort overlooks the Arabian Gulf and offers a relaxing oasis in Dubai. Just 15 minutes from Dubai Internet City, the resort is right next to Madinat Jumeirah Souk and is home to an outstanding range of onsite facilities. Set in Al Sufough, famous for its warm sunny weather and excellent golf, the resort also offers complimentary access to the popular onsite Wild Wadi Waterpark. 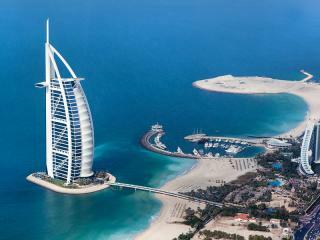 Located on the shores of the Arabian Gulf, Jumeirah Beach Hotel offers luxury accommodation overlooking the ocean. Just a short drive from the Dubai International Airport, the hotel is also within 10 minutes of sister property Jumeirah Hotel and a variety of local shopping, dining and attractions. Boasting an outstanding range of onsite facilities, the hotel enjoys its own private beach and the onsite Wild Wadi Waterpark. Close to Umm Suqeim Beach, the hotel is also close to popular attractions such as Souk Madinat Jumeirah, Ski Dubai and Burj Al Arab Jumeirah. Situated on lush landscaped grounds with the unique addition of canal-style waterways throughout, Jumeirah Dar Al Masyaf - Madinat Jumeirah offers deluxe accommodation overlooking the Arabian Gulf on 2km of private beach. Home to an excellent range of onsite facilities, the resort is close to a variety of popular local shopping, dining, activities and attractions including Dubai Internet City and the Madinet Jumeirah Souk. Located in Al Sufough, known for its excellent golf and warm sunny weather, the resort also offers complimentary access to the Wild Wad Waterpark, a popular attraction which is actually located onsite. Located within Madinat Jumeirah Resort just minutes from the Mall of the Emirates, Jumeirah Mina A`Salam offers luxury accommodation just 25 minutes from the Dubai International Airport. Situated in Umm Suqeim, the hotel is close to Dubai Media City and overlooks the Arabian Gulf. Home to an outstanding range of onsite facilities, the hotel features lush gardens and scenic waterways. Offering complimentary access to the onsite Wild Wadi Waterpark and Sinbad’s kids club, the hotel also provides a complimentary shuttle service with easy access to a variety of local activities and attractions. Situated on 65 acres of lush landscaped gardens, One&Only Royal Mirage boasts a beachfront setting overlooking Palm Island Bay and the Arabian Gulf. Offering luxury accommodation in 3 distinct yet Arabian-inspired environments, the resort is home to an outstanding range of onsite facilities as well as 1km of private beaches. Close to a variety of local Al Sufouh activities and attractions, the resort is just minutes from the Emirates Golf Club and the iconic Burj Khalifa. A stunning white sand beach stretching from the southern coastline of Dubai all the way to Palm Jumeirah, this region offers large beachfront hotels and resorts.